The ICW is part of a national religious organization, the Catholic Worker, that is advocating for peace and nonviolence. Its current focus is drone activity by the United States’ government that is killing innocent people. To expose what they view as illegal activities, the organization is writing letters, visiting legislators locally and in Washington D.C. and demonstrating at the Hancock Field Air National Guard Base in Syracuse, Pines said. The ICW is only one of many religious organizations that are trying to promote peace and nonviolence throughout the country. Currently the actions against war and promotion of peace are centered within the communities, but the hope is for the ideas to make a lasting impact and cause as much change as possible, whether it is on a national or international scale. On Earth Peace is a 39-year-old organization that is sponsoring a newer organization, Living Peace Churches, after the organization Every Church a Peace Church approached it for support. The vision for Living Peace Churches is to “Live and teach as Jesus taught,” executive director of On Earth Peace, Bill Scheurer said. 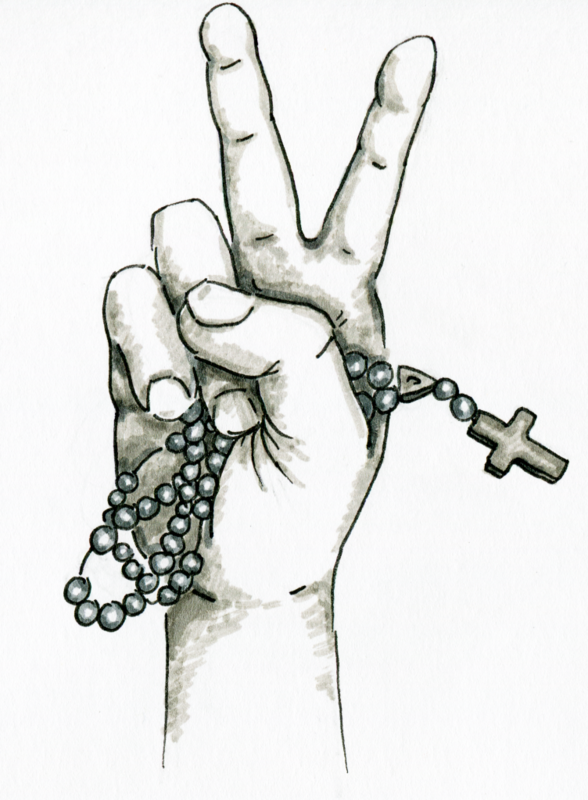 All of the peace churches will uphold the idea that Jesus advocated for nonviolence. Living Peace Churches evolved from the ideas promoted by Every Church a Peace Church, he said. On Earth Peace is conducting a pilot program this year for Living Peace Churches with 12 churches. On Earth Peace will guide the members, but there is not a list dictating what the congregations can and cannot do, Scheurer said. “The goal for the Living Peace Churches is to help all of the churches in the Jesus movement reclaim their biblical roots of peace because we come from a belief that the gospel of Jesus is in fact the gospel of peace,” Scheurer said. There will be the expectation that every church will conduct a service outreach ministry. The service outreach ministries will be the main way the churches can spread their ideas about peace and nonviolence. Another group that focuses on antiwar protest and the promotion of peace and nonviolence is the Agape Community based in Ware, M.A. The main idea that the community is grounded in revolves around prayer, faith and sustainable living. Suzanne and Brayton Shanley co-founded the group in 1982. Actions against war and the focus on nonviolence and peace play an integral role in the community. Part of the action is outside of the community, protesting the wars in Afghanistan and Iraq, but another main part involves focus on the individual trying to prevent violence. “Nonviolence is an inside job, so you are constantly working against sort of anger and frustration that can lead to violence and the worst kind of violence, you can say, is war,” Brayton said. When the community and its volunteers take action outside of the community, they try to mobilize other churches and go to the town square to hold up banners in response to specific events, Brayton said. A current aspect of war that the community has protested against is the use of drones in the Middle East. They also teach throughout the community and go to universities to spread their messages about peace and nonviolence. Another action the Shanleys take is refusing to pay taxes that support war. Brayton said he and his wife live under the taxable income level, so they do not have to pay federal income tax that would support any wars. The Agape Community is making its message of peace and violence national. Brayton recently wrote a book, “The Many Sides of Peace,” which is a summary of the main ideas the community promotes. There are three central ideas integrated throughout the book: Christian nonviolence, contemplative life and sustainable living. Shanley said his hope is to spread the ideas of the community to more people, he said. To promote his book and to share his ideas, he is currently doing a book tour throughout the country; which included a stop in Ithaca earlier this semester. There is variation among the organizations in how they advocate for peace and nonviolence, but in the end they are all reaching for the same goal and promoting similar ideas because of religious beliefs. Taylor Barker is a sophomore journalism major who is all about peace, love and the occasional cookie. Email her at tbarker1[at]ithaca.edu.